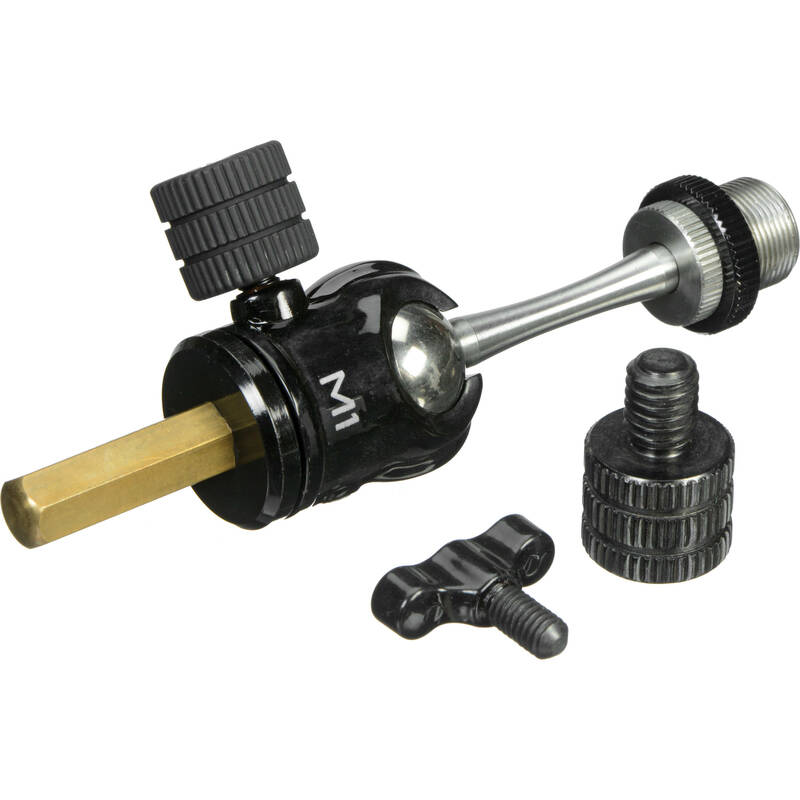 The Micro 1 M1 Long Stem Orbital Hanging Mic Adapter from Triad-Orbit employs a long stem ball swivel that provides a variety of placement options for spider shock mount and large diaphragm microphone placement, including full orbital rotation in addition to straight-line trajectory for on axis placement. Thanks to its length, it even allows you to position a spider shock mount below the boom arm of your stand. The M1 comes IO-equipped for quick-change compatibility with both Triad stands and Orbit booms. Box Dimensions (LxWxH) 5.9 x 3.35 x 1.5"
Micro 1 M1 Long Stem Orbital Hanging Mic Adapter is rated 4.5 out of 5 by 4. Rated 3 out of 5 by Eric from Looks sturdy, but isnt... I was hoping this Triad-Orbit IO system would be the audio-world equivalent of the Manfrotto micro-clamp and micro friction arm in the photography/video world. The Manfrotto products are extremely sturdy and rigid once tightened. But these are not. My setup was a K&M mic stand with two Triad-Orbit IO-C clamps mounted on it for a mid-side setup. The clamps are decent and were sturdy when tightened. But when I then install either the M2 short or M1 long-stem “orbital mic adapter” (ball-head) into the clamp, the quick-connect simply isn’t tight. I mounted standard Neumann shock-mounts onto the M2 for example, and the shock-mount is loose and wobbles ½”, and there is nothing more I can tighten to make it sturdy. The problem seems to be the hexagonal coupler which is not tight rotationally. The IO-H2 Stainless 5/8 Mounting Head that comes with the clamp seems to be sturdier, but even that has some play with a mic mounted on it. For this kind of money, I expect a top-quality, sturdy system with no play in the quick-release. I am disappointed that these products do not provide that. Rated 5 out of 5 by ZooHead from Perfect Mic Positioning It's amazing, a mini ball-head for a microphone. It's used in a hanging position and helps get your mics in position for stereo recording or an A/B mic comparison setup. Rated 5 out of 5 by Steven from Perfection! I use both the M1 and M2 with my 2X/O2X Dual and with the O1 Single Boom and theyre absolutely perfect for positioning the mics where they need to be. Rated 5 out of 5 by Mr.Acoustics from useful ! I use this for uplight piano miking. It was really useful to miking without tripod stand.